Sherlock Holmes (novels & short stories) | Narration by George! A Study in Scarlet is the first book or story that mentioned Sherlock Holmes. We discover how Holmes and Dr. John Watson meet and come to reside at 221B Baker Street. Inspector Gregson approaches Holmes to help him with a murder which has taken place at night at Number 3, Lauriston Gardens, near Brixton road, London. The murder is strange because nothing has been stolen from the dead man. And there are no marks to indicate a fight. To top all of this, the man lies murdered in a house that has been vacant for a long time. And ”RACHE” is written in blood on the wall, near the man. Now, obviously, there are many questions… Tons of questions of course, taking the mystery deeper and deeper. All the way back to Utah! 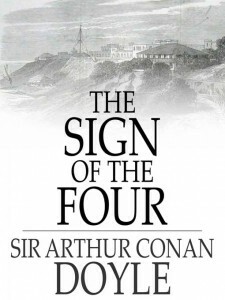 Production begins soon on the second of the Sherlock Holmes novels. This story has a complex plot involving service in East India Company, India, the Indian Rebellion of 1857, a stolen treasure, and a secret pact among four convicts (“the Four” of the title) and two corrupt prison guards.